Wallpaper switchers are not a new invention. If you’ve ever found yourself bored with a background image that once seemed beautiful and dramatic, you may have felt the need for such a tool. However, few applications (and even fewer free applications) mature over time to become as capable and impressive as John’s Background Switcher. John’s Background Switcher can pull wallpaper images from a range of online sources, as well as from your own computer. John’s Background Switcher (or JBS) can pull in images from a wide array of online sources, such as Flickr, Facebook, and SmugMug. It also works with VladStudio, a website that specializes in wallpapers. If the images you’re looking for aren’t located in any particular website, JBS can even use Google, Bing or Yahoo! image search with any query you provide, to pull in images from across the entire Web. 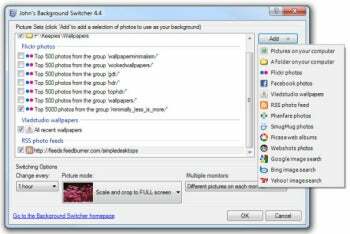 You don’t have to commit to just one wallpaper source: JBS lets you mix and match multiple sources, each with its own source-specific options. For example, when you poll Flickr for images, you can specify a search string (a generic option), but you can also narrow your search down to a specific Flickr group and select whether to sort images by “interestingness” (a Flickr metric) or newness. You can also poll the same source for images in multiple categories--I have seven different Flickr profiles set up. Some websites, such as DeviantArt, publish RSS feeds that contain images. JBS can hook into such feeds and use them as image sources. Sadly, this doesn’t work with every feed--feeds must be in a specific format called Media RSS. My own personal favorite, Simple Desktops, does not export such a feed. Since images are pulled off the wild wild Web, they may not always agree with you. If you like a certain feed but find an image offensive, you can right-click the JBS system tray icon and select “Never Show Again.” JBS saves its URL in a “banned wallpapers” list, and that’s the last time you're likely to see of that particular wallpaper. If an entire source isn’t returning the results you’d hoped for, you can always tweak it and try again. On the other hand, if it is working but you’re just tired of it for now, you can just disable that feed in JBS. This way, you don’t lose all the time you spent configuring it, and can enable it at a later time. JBS can also change the background for the Windows logon screen. This is not the first utility I’ve come across that can do this: Commercial tool DisplayFusion Pro also includes an option to replace the logon screen background, but pops up a UAC prompt every time it tries to switch backgrounds. JBS makes the switch seamless, nary a prompt in sight. John (the developer) tells me this was accomplished by having the installer tweak file permissions, making prompts unnecessary. Once you switch this option on, your logon screen will always match your wallpaper, giving the system a uniform look. As far as wallpaper switchers go, John’s Background Switcher is one of the most capable tools I’ve had the pleasure of using so far, and it comes at a price that can’t be beat.